If you’re anything like me, you’re a basket case when it comes to filling your grocery basket. It’s not just the mind-bending options available (37 different varieties of Doritos); it’s also the vexing political and moral calculations. I’ve never gone in for those socially conscious mutual funds; I don’t really see the moral pitfalls of owning defense stocks. But when it comes to food, my brain becomes a mini debating society. Fresh blueberries? They look great, and I want them out of season, but the fuel spent to bring them here from Chile seems wrong. My parents boycotted grapes in the 1970s out of solidarity with Cesar Chavez and the United Farm Workers—but hey, that was one product. Today, we’re so imbued with the idea of making ethical choices that our heads are buzzing, at least until we say “F—k it,” pull into BP, buy some smokes, and hop back in our Suburban. What if the majority of elected Republicans believed (or were free to say without being primaried) that man-made activity causes climate change? Sure, environmental legislation might actually be able to move forward. But there’d be an equally important consequence of global warming entering the realm of normal politics. We’d have an actual contest of ideas. Instead of arguing first principles we’d begin asking, on a bipartisan basis, what to do about the problem. Spend more on solar, or carbon capture, or what? I suspect that Republican market-oriented thinking would help. Republicans came up with widely praised ideas like the individual mandate in health care, although they later chucked it the way a robber might toss a gun in the river. Cap and trade emerged as a reasonable way of controlling acid rain in the 1990s under President George H. W. Bush. It’s not that there wasn’t lobbying and dealing and ill will. But at least there was the kind of agreement about the basic facts that allowed politics to work. At a time when so much of the GOP is treating global warming as a theory (hey, so is gravity), it’s intriguing that the John F. Kennedy Library Foundation gave its Profile in Courage Award to Representative Bob Inglis, a former Republican House member, who is working on climate change issues after once being indifferent. The Baltimore riots this spring reminded a lot of people of Spiro Agnew, who was the governor of Maryland when the city erupted in 1968. Agnew’s law-and-order crackdown caught the eye of Richard Nixon and infuriated the state’s black leaders. But Agnew wasn’t always seen as hostile to racial struggle. As Baltimore County executive, Agnew won the governorship in 1966 against Democrat George Mahoney, a segregationist. By contrast, Agnew denounced bigotry, backed an anti-discriminatory open housing law, and even as a Republican garnered 70 percent of the black vote. (If it’s hard to think of Maryland, now almost 30 percent African American, as a font of segregation, remember that it was more southern and white back then. It’s telling that George Wallace was shot in Laurel, Maryland, during his 1972 presidential campaign.) Agnew had been governor the same short amount of time that Sarah Palin had been when she got tapped by John McCain, and while Agnew seemed unqualified, especially when it came time to square off against Leonid Brezhnev, the choice seemed less laughable than McCain’s would later. But Agnew was also a hatchet man and a criminal who took bribes in brown paper bags and was ultimately forced to resign. Finding a completely separate criminal track from Watergate was an impressive feat. After office, he puttered and wrote a thriller that was widely considered anti-Semitic. How Nixon found someone who could amplify his own worst traits seems part of his pathology. What’s less remembered now is that Agnew had a streak of good underneath all that criminality. One positive thing about the 1968 tickets is that by choosing Edmund Muskie of Maine and Spiro Agnew of Maryland, Hubert Humphrey and Richard Nixon helped break the obsession with finding running mates from bigger states. It’s now common to have veeps from states with just three electoral votes—Cheney, Palin, Biden. (Okay, maybe those aren’t the most comforting examples.) Still, I’d be glad to see Jack Reed be Hillary’s veep. The Rhode Island senator is widely respected on defense issues; he’s a West Point grad, and he and Hillary worked on the Armed Services Committee together. Just as Barack Obama, poised to be the first black president in 2008, knew that he was best off running with an older white man, so too, I suspect, Hillary won’t tempt fate by picking a woman or a minority. What is it about Hillary that continues to make people lose their minds? When I began covering the Clintons in 1991, her critics on the right would grumble that she was a power-mad closet socialist who encouraged her husband’s affairs because she was a lesbian, had an affair with the late Vince Foster, and would divorce Bill as soon as he left office. Now, everyone I talk to on the left hates her. They see her as the worst of both the ’90s (DOMA and derivatives, gay bashing and financial deregulation) and the 2000s (her vote on Iraq). Older computers used to have what was called a Save/Get key, with which you could cut and paste something you’d written. Maureen Dowd’s Save/Get invective about the Clintons—Hillary is conniving, Bill is untamed—is entertaining, but it’s no more illuminating than it was a generation ago. Hillary got a break for a while. The press used her as a foil with which to bash Obama. She was wily. He was OBambi, as Dowd put it. The Clintons reached out. Obama was aloof. Hillary understood power and he didn’t. With Obama’s expiration date coming due and Hillary running, the focus is back on her, and the familiar tropes are back. I don’t claim any great insight, but maybe I can offer a little. I covered the Clintons during their first presidential run and White House years. My ex-wife made ads for Bill and Hillary’s campaigns and works for Hillary now. In the past I ran into them socially more than most reporters, and I know a lot of people who have worked for them for a long time. My take is kind of a spin on that old political science adage that Americans are theoretically conservative and operationally liberal. They like small government in theory and a fair amount of big government in practice—thus the maddening demand to “Keep government hands off my Medicare.” My sense is that Hillary, schooled politically in the South in the Reagan ’80s, doesn’t advertise her progressivism but achieves it behind the scenes. I used to tell friends on the left that Obama might sound more liberal than Clinton, but operationally she’d probably get more done. If you entertain the Elizabeth Warren-Bernie Sanders fantasy of breaking up big banks, however desirable, then Hillary looks like a sellout. If you think the best you can do is get more regulation, Hillary will get you there. The personal attacks on the Clintons, the spectacle of impeachment, and the suicide of a close friend all gave Hillary a more realistic sense of what was possible in blood-sport Washington. Obama could come to Washington believing that the conciliatory skills that had allowed him to bring conservatives and liberals together at the Harvard Law Review would work in the Senate and the White House. Clinton knew that wasn’t possible in a Washington where Republicans would vote in lockstep against Democratic initiatives and question presidential legitimacy, whether it was obsessing about Obama’s secret birth in Kenya or putting Bill Clinton on trial in the Senate. The admirable part of Clinton’s experience in the late ’90s and early 2000s is that she joined the obstructionist Senate that had nearly convicted her husband. Being able to find ways to get a few things done with Tom DeLay (adoption) and Newt Gingrich (electronic medical records) didn’t make her either a saint or a sellout. She knew how to manipulate power large and small, from her much-remarked-upon determination to keep her head down—a model for other famous folk coming to the Senate like Elizabeth Dole and Al Franken—to knowing what issues could be done. That said, Clinton is not without a dissembling side. She has said that her Iraq vote was merely meant to give the president the diplomatic tools to get Saddam Hussein to comply with international inspections. But did anyone who lived through that period really think that Bush was merely interested in diplomacy? A vote for war was a vote for war. Ten years ago this summer, I thought I was going to prison. My Warholian burst of fame came as part of the CIA leak case in which I was in contempt of court for not revealing sources. I had written a piece for Time, “A War on Wilson?,” about how the Bushies were trying to screw Ambassador Joseph Wilson, who had sounded the alarm about WMDs in Iraq. The odious Karl Rove and I worked out a deal, and I was spared my Orange Is the New Black moment. I’m glad I’m in the sixteenth minute, with all that behind me. I continue to worry, however, about reporters and sources, although not in the usual way. The Obama administration’s pursuit of journalists has been reprehensible. (David Petraeus never did time for leaking; whistleblowers are languishing in prison.) Journalists and the First Amendment bar have been pursuing a shield law to protect reporters, and I think they’re right to do so. I testified before the Senate for it, and it’s worth noting that Indiana Governor Mike Pence, reviled by liberals, was the House sponsor. But no law can be tight enough to protect all journalists in all circumstances, which is why we depend on custom more than law, the willingness of most prosecutors not to go down that road. Eric Holder came late to that realization; sending James Risen to prison was avoided at the last minute. But why did it have to come to that? As long as we’re talking about Agnew having a silver lining, Nixon’s craven attorney general, John Mitchell, issued rather sensible guidelines on subpoenaing the press that have been largely ignored. This issue features a must-read excerpt from the new memoir by Eleni Kounalakis, Obama’s former ambassador to Hungary and a friend of this magazine. While she was in Budapest, the NATO ally took an ominous turn toward authoritarianism: cracking down on press freedom, attempting to undermine the independence of the judiciary, and so forth. Kounalakis chronicles a Hillary Clinton who used her trademark “smart power” to push back with a combination of inside diplomacy and the rousing of outside opposition from the European Union and civil society. The episode speaks well of Clinton and her diplomats, though they won only grudging and partial concessions from the hard-liners in Hungary. It’s hard to see what else the U.S. could have reasonably done. Like Dwight Eisenhower, who, in very different circumstances, decided not to intervene in the Hungarian uprising of 1956, the U.S. had limited options. Beyond Benghazi, as my Newsweek colleague Nina Burleigh notes, Hillary had many such moments where she wielded power well but faced very high odds. Is it really worse than ending up in PR? I’m fascinated by how transient Americans are when it comes to their faith. According to the Pew Research Center, half of Americans switch religious affiliation at some point in their lives. That’s certainly true of the presidential candidates. Marco Rubio was born Catholic. The family became Mormon when they moved out west and then went back to Catholicism when they returned to Florida. He attends both Mass and an independent Christian church that his wife goes to. My favorite religion-switching tale is still that of Howard Dean, who left the Episcopal Church because his parish opposed a bike path. He became a Congregationalist. No word if his golf game suffered. By the way, Agnew was Episcopalian, not Greek Orthodox. I’m not sure why it’s been fifty years since the country elected a Catholic. Once the barrier was broken you would think more would have followed. But there’s only been one Catholic presidential nominee since JFK, and it was another JFK, John Forbes Kerry. Jeb Bush could be the second Catholic president, which is still a hard concept to grasp. I try to imagine his WASPy grandfather, Senator Prescott Bush of Connecticut, who was in the Senate during JFK’s presidency and who declined to run in 1962 in part because of Catholic concerns about his stance on birth control. (Connecticut, now seen as so progressive, was the home of the Griswold decision, which allowed married couples to buy condoms.) Could JFK have imagined that the next Catholic to take the office wouldn’t be some Irish Bostonian or an Italian from Chicago but Prescott’s grandson? When I tell people that Hillary is a Methodist—and a devout one—they’re sometimes surprised. They think of her as a totally secular liberal. But Clinton is very much in keeping with the church’s social-gospel tradition. Her transformation from Goldwater Girl to Wellesley Nixon-hater began with her church pastor taking her to Chicago to see Picasso and hear Martin Luther King Jr. The upside of this tradition is the wonderful work that’s done by those who have lived the social gospel from abolitionism to today. The downside can be, occasionally, a less joyful sanctimony. I sometimes think of the Clintons not as Machiavellian but as Broadway characters out of Guys and Dolls. He’s the carouser; she’s the Salvation Army gal. That’s my trope. I grew up in the 1970s and ’80s and never understood the appeal of Bob Hope. He had an occasional long Jack Benny stare that seemed droll. But my parents were liberals, and there was a visceral sense in the house about who in Hollywood supported Nixon and who didn’t, and Hope was definitely the former. Richard Zoglin, once a colleague of mine at Time, has a terrific new biography of Hope, which shows how he dominated twentieth-century entertainment—vaudeville, radio, movies, TV. He hosted or cohosted the Oscars an incredible nineteen times. His 1970 Christmas special from Vietnam is the fourth-most-watched non-sports, non-news TV event after the final episodes of M*A*S*H, Dallas, and Roots. And his relationship with Nixon? Hope is on the tapes, cheering on the stepped-up bombings of North Vietnam in 1972. Have you seen Al Franken’s impersonation of Bernie Sanders? Following Hillary’s keep-your-head-down model, Franken has avoided the limelight in D.C. unless it’s for issues that really concern him, like the Comcast-Time Warner Cable merger that he helped derail. But the YouTube video of him impersonating that other Senate progressive is pretty awesome. Look for it to be copied back at Franken’s alma mater, Saturday Night Live. Most political comics don’t understand that the key to an impersonation isn’t perfectly capturing the cadence and timbre of a politician’s voice. It’s more about exaggerating a feature of it. That’s why Dana Carvey’s George H. W. Bush remains so classic, more so than Will Ferrell’s George W. Bush or Phil Hartman’s Bill Clinton, which are both great. Ferrell and Hartman got the voice, but Carvey’s, which is the least accurate, is the funniest because it captured the first Bush’s slightly manic “Not gah-nah dooo it” and his constant return to talking points—those thousand points of light. If we don’t get a good impression of Ted Cruz or Bernie Sanders this year, what’s the point of having an election? I miss the Public Interest, the small, picture-less policy journal that Irving Kristol, Daniel Bell, and Nathan Glazer founded fifty years ago. Daniel Patrick Moynihan and James Q. Wilson were longtime contributors. It cast a skeptical eye on Great Society ambitions, and dwelled on the questions of what made programs fail despite their designers’ best intentions. It became more doctrinaire conservative as the years went on; when Bell left as editor, Glazer replaced him, and he later lamented that there weren’t more liberal voices. In 2005 it went under. Today its intellectual heir is National Affairs, the house organ of the so-called Reformicons. You have to welcome anyone who takes policy seriously and is interested in having government work—a rather obvious goal but one that both parties, especially the Republicans, seem perfectly capable of ignoring. Still, National Affairs seems way more ideologically conservative than the Public Interest ever was. In its best years the Public Interest aroused a certain excitement, even among many liberals, who thought Commentary too shrill and the New Republic too divorced from the nitty-gritty of policy. Today, even fewer organs are devoted to understanding what does and doesn’t work on the ground. The Atlantic is a treasure, but they publish more end-of-men articles than fresh thinking about government. 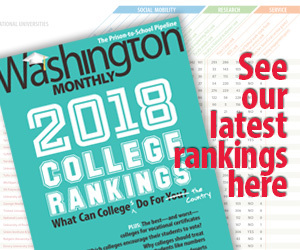 Fortunately, the Washington Monthly has stayed true to its mission, and the archives of the Public Interest are all online. MSNBC’s Alex Wagner was on Real Time with Bill Maher the other night, cheering the way Hillary Clinton, in a speech on judicial reform, was distancing herself from the ’90s policies of her husband. Wagner also chided the “white Democrat coalition” Bill Clinton represented. The first part of what Wagner said made sense. The incarceration policies of the ’90s are widely seen as having had disastrous consequences. But the MSNBC host’s characterization of the ’90s Clinton coalition as “white Democrat” left me rolling my eyes. First, it’s inaccurate. Clinton was the choice of African Americans, not the choice of white voters, who haven’t given Democrats a majority of their vote in a presidential race since 1964. Second, while Bill’s coalition was whiter than Obama’s, that’s partly because the country is so much more minority heavy than it was back then. It’s true that Clinton had more success adding whites to his coalition than has Obama (or Kerry), which is largely due to the troubles liberals have had with the white working class—a trend this magazine has plumbed deeply and with understandable urgency (see Stan Greenberg, “The Average Joe’s Proviso,”). Why an MSNBC liberal would chide Bill Clinton’s success at drawing whites—one echoed by Hillary’s ability to reach these voters in the 2008 Democratic primaries—seems, well, puzzling. I must say that I wish the Public Interest were here to write about it. Matthew Cooper is a contributing editor at the Washington Monthly and Washingtonian.